Matellion CG note book 2.0: 為什麼只懂一項軟體的CG藝術家正在絕種 ? WHY THE CG ARTIST WHO ONLY KNOWS ONE APP IS DYING? 為什麼只懂一項軟體的CG藝術家正在絕種 ? WHY THE CG ARTIST WHO ONLY KNOWS ONE APP IS DYING? I recently read a article about a cg artist who just know one app could be Eliminated. So I like to share with you. If you’re an artist who has been focusing on mastering that one piece of software you learned in college, you might want to re-think that strategy. Knowing a single software program, no matter what program that is, won’t be enough to get you through your career – no matter the discipline. The reason is actually quite simple: big effects are being created by increasingly smaller budgets. As the old adage goes, “You can have it fast, cheap or good. Pick two.” While this saying may have a glimmer of truth in it, the fact of the matter is that studios around the world are being asked every day to deliver on all three: fast, cheap and good. For studios to deliver big effects on shrinking budgets means they are always on the lookout for artists who are not only good (or even better, great) but are also fast and yes, cheap. 正如一句老話，你可以讓他" 快 " "便宜" 或 "好" 擇二。當這說法也許有一絲絲真理的曙光在裡面，事實的真相是全世界的工作室正在每天被要求給予這三項 : 快 便宜 好。對於工作室要交付預算縮減的大型特效，意味著他們總是在尋找不是只有好 (更好 或 極好)，而且要"快" 當然 要"便宜"!! Unfortunately the term cheap gets some negative connotations with it, so let’s make sure we’re on the same page on what we mean by cheap in this context. Cheap in this context doesn’t mean slashing salaries. 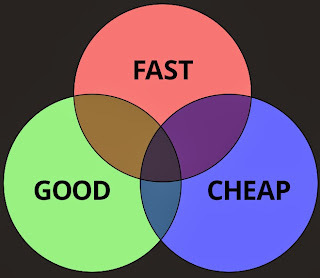 In this context, fast and cheapactually mean the same thing. As yet another adage says, “Time is money.” An artist who can deliver quicker than their counterparts is delivering on both fast and cheap simply by saving the cost of the time. An artist who can deliver great work in this shortened time is truly an artist who is delivering on all three: Fast, cheap and great work. In the long run, it is actually cheaper for a studio to pay a higher salary to an artist who can consistently deliver great work fast than it is to hire an artist who spends a lot more time to deliver the same quality of work. A great example of this long-term frame of mind can be found when a studio invests in creating custom tools to help speed up their artist’s workflow. Before they were available to the public, tools such as MARI were born out of the necessity to be able to deliver great work within a time-frame that simply wasn’t achievable with the tools that the artists had. Think about the amount of time, money and effort that goes into creating new software just so the artists that use the software can meet the expectations of delivering great work on time and on budget. Could the artists at Weta have created textures for Avatar without building a new tool? The capabilities for creating textures certainly existed. Given enough tweaking time, anything can be made to look great. But what about the everyday artist? Not everyone has the luxury of working for a studio that can develop proprietary tools. Then again, not every project requires brand new software to be developed for it to be successful. The key to success comes when you start to understand that all software, is just a tool that can be used to deliver great work. Regardless of the software you use, the faster you can deliver great work the more success you will have. If you’re only using one software program for everything, try setting yourself up for success by looking at the tools available in your discipline. Existing software tools are constantly improved and new software tools pop up all the time. In the fast-paced CG industry, everyone benefits when they adapt positively to the change that is bound to happen. While the specific tools you end up adding to your repertoire will vary depending on your discipline, here are some of our favorite methods for taking that next step and transitioning from a single-software artist to an artist with an arsenal of tools. Learn the fundamentals. When you know the fundamentals of 3D, it’ll be a lot easier to bounce between different 3D programs. Find a part of your workflow that you want to spend less time doing. Chances are pretty good that you’re not the only one who doesn’t enjoy doing certain parts of your workflow. That usually means someone has taken the time to figure out how to speed it up. Add something extra to your work. Sometimes it is necessary to learn new software to take your work from good to great. Learn about the steps around you. Knowing about the parts of the pipeline around your discipline can help you create assets that fit into the pipeline better. This means less revisions and, by extension, faster end results. So, after i read it, I thought that i am on the right way. But, I should make my mental peace to face the disorderly society of Taiwan.